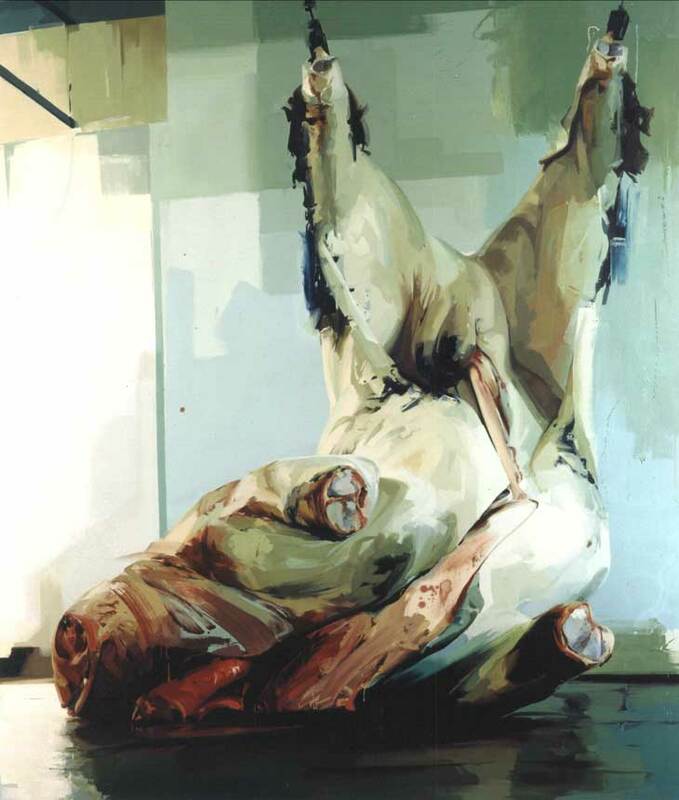 You are currently browsing the tag archive for the ‘Jenny Saville’ tag. thick with its own agenda. the restlessness that comes with waterless places. My friend LP, AKA Lisa the Poet, came into my life around a lecture delivered by artist Jenny Saville at BU. The rest is history. This poem was recently featured on Zócalo Public Square, the best place to find poetry these days according to LP. I’m not arguing with that since I think this is a fabulous, evocative, hauntingly present poem. LP, I need more of this. This quote by de Kooning came to me by way of my friend Nada Farhat. 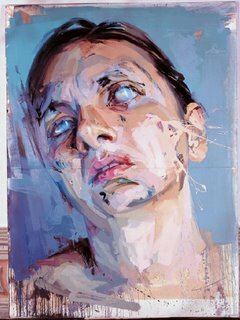 Like Jenny Saville whose eye sees violence in everything, from a cadavar to a painting by Degas, we are all filtering reality. I know my filter can change quickly, from rose-tinted to dark and back again in a very short period of time. One of the most successful cineatic demonstrations of that shifting vision is the movie, My Dinner With Andre. At the beginning of this conversation-as-movie, Wallace Shawn is overwhelmed by his life—he is a financially strapped artist who remembers his childhood of wealth and luxury—and the film begins with a heightened sense of that reality. The New York City in the film’s first few minutes is a hard edged and inhospitable place. But at the end of the film, after his eponymous and enlightened dinner with Andre Gregory, Shawn’s cab ride home is through a city that feels magical, all alit and gorgeously full of promise. But trembling. What a great word for de Kooning to use in his quote. I had a conversation yesterday with LP (Lisa the Poet) about speaking the truth whether it be in poetry or in the visual arts. 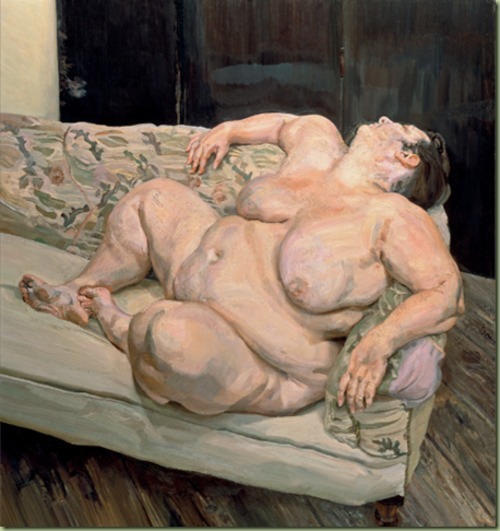 She went to the same lecture by Jenny Saville that I have written about here (although at the time we did not yet know each other) and felt immediately at home as Saville took her audience on a visual tour of many of her haunts for inspiration—the morgue, slaughterhouses, plastic surgery medical files. LP said that Saville was showing us the world and saying in effect, look at these things, really see and accept the reality that is life. As a non-representational painter, truth speaking takes a different form for my work. But it is still important to me—very important. It feels like this is music written for a different scale, that doesn’t translate over into a 12 tone frame. I was also painfully aware of how difficult it was for me to articulate this distinction in my conversation with LP, something that made me feel the need to pay more attention to what this is. So I returned to my notes from Saville’s lecture. Here are a few of the jottings I took down that night that may or may not offer insights into this complex but compelling set of issues. Getting out from under the “burden” of painting was important to her. When she started looking at medical images and reading about the body in that detached, scientific way, the “veils of art” were gone. She began a phase where she stopped looking at art and turned to other image making forms to get at the raw state of things. When matter is out of place, everything changes. That is what she was seeking in her exploration of “monstrous” sized bodies that live outside the norm, or in putting pig intestines in unfamiliar contexts. Warhol presents icons of violence in a cool and detached way. It is his endless multiplicity of an image that is the violence in his work. She looks for the in between–a body that is too big, a hermaphrodite, siamese twins, the border between life and death. Semiotics is concerned with everything that can be taken as a sign. A sign is everything which can be taken as significantly substituting for something else…Thus semiotics is in principle the discipline studying everything which can be used in order to lie. If something cannot be used to tell a lie conversely it cannot be used to tell the truth: it cannot in fact be used “to tell” at all. More is needed on this, clearly. 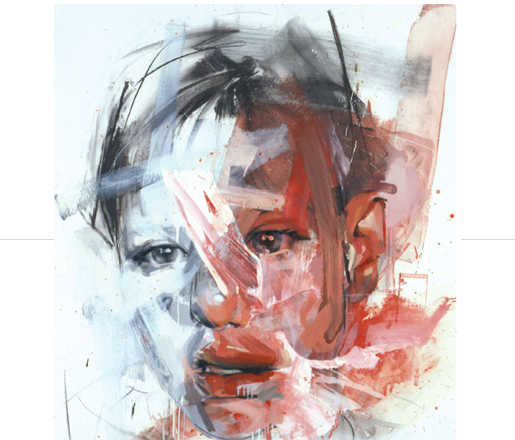 I’m still on a Jenny Saville bender (see post below)…Here are a few passages from an interview with Saville conducted by Suzie Mackenzie of the Guardian. I found these passages provocative and insightful. She attributes the early “fascination with fat” to sitting on the floor watching her piano teacher. “From below she had these big, thick thighs, a thick tweed skirt and tights, and I’d spend the whole time looking at the way her thighs never parted and how the flesh would rub against the tights.” People sometimes observe that the experience of looking at one of the big early Savilles, with their dramatic cropping and foreshortening, is a bit like a child confronting a grown-up. A mix of awe and intimacy. “I wanted both in those pictures. A large female body has a power, it occupies a physical space, yet there’s an anxiety about it. It has to be hidden.” So a part of it, she says, was a search for intimacy, “as if being in a mother’s arms”. And part of it was discomfort, “the anxiety that comes from living with flesh”. Females, as she says, are used to being looked at: “I don’t like to be the one just looking or just looked at. I want both roles.” Taking herself as her own model, her exaggerated nudes point up, with an agonising frankness, the disparity between the way women are perceived and the way that they feel about their bodies. Their massive bodies look diseased, half alive, half dead, the skin erupting in places as if cracking under the strain of having to contain so much fat, so much anxiety. In Branded, she inscribed on the flesh adjectives often used to describe women: “supportive” is scratched across one breast, “irrational” across the other; “delicate” across the midriff. 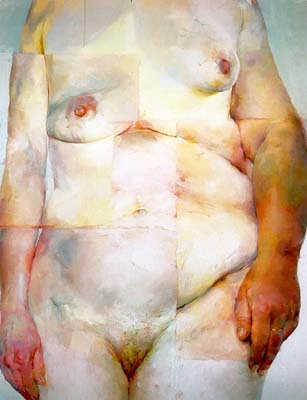 This week we heard painter Jenny Saville speak at Boston University. Thirty minutes before the lecture was scheduled to begin at Morse Auditorium, 500 people were already in a line snaking down Commonwealth Avenue. My initial reaction was, how cool. How often do you find people waiting in a long line to hear a painter talk? Sure, Saville is an international art star of the first order. Her work sells at astronomical prices. 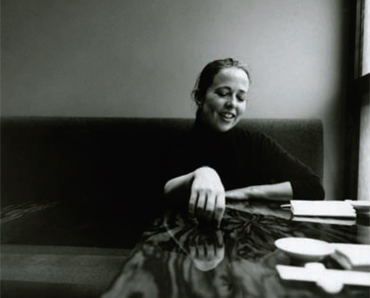 And as one of Saatchi’s early finds (he purchased her entire graduate exhibit) and part of the juggernaut of successful artists known as YBAs (Young British Artists), she hit the big time in her early twenties. Now she has a lottery winner’s life, living in a magnificent but tastefully dishabille 18th-century palazzo in Palermo, Sicily. She has 22 rooms that each house a painting she is working on. OK, it does sounds like the ultimate painter’s dream. But this was no lifestyle evening. Saville stood up and launched immediately, talking for 90 minutes straight. Using double screens, she showed examples of her own work alongside images that have inspired her. Her source material was a steady stream: Photographs of distended, obese bodies; medical textbooks for plastic surgery; burn victims; murder scenes; slaughterhouses; autopsies. But there were also lots of paintings—Soutine, Degas, de Kooning, Velasquez, Warhol, Pollack. Clicking through hundreds of slides, her energy and passion for the power of these images never flagged. Saville isn’t slick or particularly polished. She seems to struggle to capture in language what her eye sees with such alacrity. Her description of her struggle as a woman artist who must, as she put it, get out from under the “burden” of the painting canon was delivered haltingly. It isn’t her content or her narrative that compel me; it is rather a dauntingly brilliant hand. There’s so much love and respect in her for wet pigment on a surface. Her mastery is in understanding how plasticity becomes an artifact with its own eminence. Saville’s work is a cacophonous celebration of paint. Her immense canvases, when encountered close up, are complex, lush and juicy. Stepping back from the abstraction of the microview to perceive her larger than life figurative imagery—exploring the vicissitudes of flesh has been her primary project since art school—offers up a completely different encounter with her art. Both are valid means of experiencing the potency of a Saville painting. Many times she referred to the “violence” she sees in a painting or an image. She sees it in dead bodies and mutilated limbs. 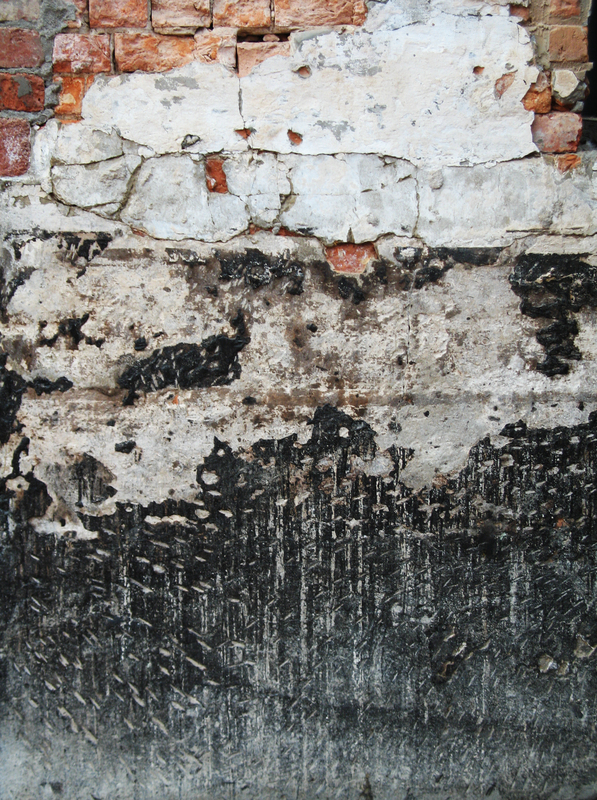 But she also sees it in the streak of red paint in a de Kooning, in a young girl’s hair being combed in a Degas, in photographs of derelict buildings and crumbling ruins. That is Saville’s lens on the world, and it leads to paintings of subject matter that speak to that view. While that is not my lens, I am inspired by her relentlessness. Saville speaks about her work without self-regard or arrogance. She has an unbridled intensity and humility (“This painting was supposed to be about the different tones of flesh, but I think I failed miserably”) that is palpable. She seems at ease opening her kimono to an auditorium full of strangers and exposing her peculiar and extraordinary mindset. I was not expecting that level of candor. I’m too quick to assume celebritism kills what was once authentic in a person who has achieved that level of success. How wrong I was. At one point she described herself as having a “vicious” eye at collecting imagery. Well put. When I think of Saville now, I envision her as a giant cosmic eyeball that never stops scanning and absorbing everything in its domain. And doing so with intense heat. A hot, provocative, relentless eyeball. She was, and is, unforgettable.